This is a summary of the release notes for XWiki Commons, XWiki Rendering and XWiki Platform, for the whole 9.x cycle (i.e. the whole year 2017). They share the same release notes as they are released together and have the same version. We switched from the old "XWiki Enterprise" package and we now provide the "XWiki Standard" flavor. When creating a new wiki, Administrators can choose which flavor they want. In XWiki, a flavor is simply a bundle of extensions that serve a particular usage. We expect in the future that the community members will provide additional flavors built on top of XWiki. Imagine a flavor for application development, one for documentation, one for procedures or even a flavor created especially for your team. Using flavors you can customize your XWiki to the smallest details. Notifications is the biggest new feature for this cycle. You can subscribe to be notified about events happening in your wiki. You control the level of details you want to receive and what applications and pages are interesting for you. For example you can decide to receive Notifications when Comments are created but only on the Blog page and its children. Notifications can be received in the UI or by email. The emails are sent periodically and according to you preferences: hourly, daily, weekly or live. A user can now define notification filters that are either inclusive or exclusive, and can even black list some users. The Watchlist feature has been deprecated by the Notifications functionality. In 8.x we added the CKEditor. Since then we improved even more the integration by preventing the editor from generating content that cannot be saved as wiki syntax, adding more styles supported by XWiki, creating dedicated Insert Macro buttons, importing office files directly from the CKEditor, etc. The support for wiki rendering macros has also been improved. Inserting a block-level macro in-line will split the paragraph, avoiding the "macro cannot be used inline" error. We also upgraded the editor to the 4.7.3 version which brings a couple of improvements and bug fixes. We finally removed the old WYSIWYG editor based on Google WebToolkit. The Administration has been reorganized. Most of the administration sections from the "Applications" group have been moved to existing or new groups. We applied a consistent style across all the administration sections and we added more hints for the configuration options. The administration menu is now implemented using a collapsible accordion and has a search input at the top that can be used to filter the administration categories and sections. If you have performed an operation that deletes multiple pages at the same time (like delete with children or delete space), it is now possible to restore all the deleted pages together, to their original state and location. For each deleted page, you can now also choose to see the batch where it was deleted from and if you want to restore just one page or the entire batch. Preview of attachments are displayed in the attachments tab at the bottom of the page. We improved also the Attachments tab from the Page Index by providing a thumbnail preview for image attachments, allowing filtering by attachment type, file size, date, etc. Added several improvements also to the Attachments Selector. Added support for attachments bigger than 2GB and many other Filesystem attachment improvements. We added user suggest and date filters for our LiveTables. We also provide a suggest filter for any column that corresponds to a Database List property. Multilists are now filterable. Working with the syntax has become easier. The Syntax Highlighting Application is now bundled and used in the wiki and object editors. A new Blame View was also added to the code viewer (More Actions > View Source). In this mode, each line of the page's content is annotated with the last author that modified it and the revision in which this modification was introduced. The blame view also works when viewing the source of a page revision (other than the latest one) so it can be accessed at any point in the history of a page. We are slowly improving usability across the interface. From improving the grouping and naming of our menus, to bundling more useful applications for newcomers, like the Help Center and the Menu Application. We improved the way we recommend Templates when creating pages. Example: When going to the Blog home page or when on any Blog post, if you try to create a page, you will see that the Blog Post Template will be displayed first in the list and it will be pre-selected. The Admin user used to be an Advanced user by default, and this was troubling for users discovering XWiki since they were seeing advanced features from the onset. The Admin user is now a Simple user. We will continue improving usability across XWiki. If you have suggestions don't hesitate to tell them at forum.xwiki.org. Now, the events described in the notification emails are ordered by pages, and then by dates. To have a quick view of all the changes, a table of content is now displayed at the beginning of the mail. In XWiki 8.2RC1 we made CKEditor the default WYSIWYG editor but the users could still use the old Google WebToolkit (GWT) editor by enabling it in the wiki administration. Starting with this version the old WYSIWYG editor is no longer available. 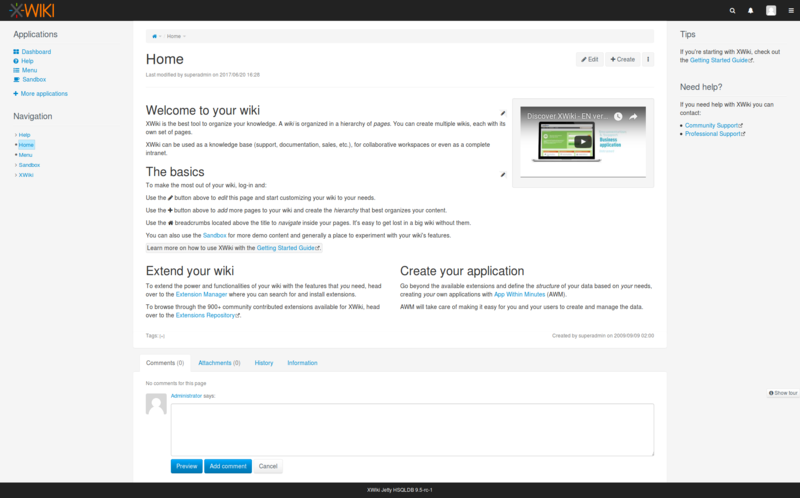 CKEditor remains the only WYSIWYG editor option available in XWiki by default. To work around database limitation when deleting documents with a lot of attachments a new file recycle bin component has been introduced. Speed up display of flavors mostly containing core dependencies (when resolving flavors dependencies, just assume those with know recommended versions are valid). When writing XWQL or HQL, it's easy to forget to escape the %, _ or even the [ character in LIKE clauses. It's also easy to forget that MySQL considers the default escape character to be \ and thus when you have a serialized Entity Reference in a LIKE you need to change the escape character as otherwise pages with dots (.) in their names won't match! To avoid bother we're introducing a new Query Manager API when binding a value. If you wish to see the full details of all features and improvements you can check each release note.